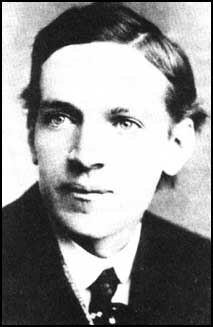 Upton Sinclair at the time he first achieved muckraking fame. 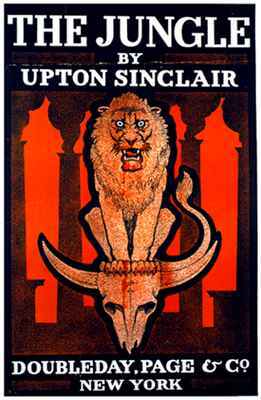 Upton Sinclair was a desperately poor, young socialisthoping to remake the world when he settled down in a tarpaper shack in Princeton Township and penned his Great American Novel. He called it "The Jungle," filled it with page after page of nauseating detail he had researched about the meat-packing industry, and dropped it on an astonished nation in 1906. An instant best-seller, Sinclair's book reeked with the stink of the Chicago stockyards. He told how dead rats were shoveled into sausage-grinding machines; how bribed inspectors looked the other way when diseased cows were slaughtered for beef, and how filth and guts were swept off the floor and packaged as "potted ham." In short, "The Jungle" did as much as any animal-rights activist of today to turn Americans into vegetarians. But it did more than that. Within months, the aroused -- and gagging -- public demanded sweeping reforms in the meat industry. President Theodore Roosevelt was sickened after reading an advance copy. He called upon Congress to pass a law establishing the Food and Drug Administration and, for the first time, setting up federal inspection standards for meat. Sinclair, all of 28 years old, had gone overnight from literary failure to the man who took on the mighty "beef trust" -- and won. Visions of ridding America of all its capitalist evils came floating into his head. Reporters flocked to the author's farmhouse at Province Line Road to find out: who was this skinny, smiling young man with the pale face and intense eyes? Upton Beall Sinclair was, for all his socialist thought, the very model of the all-American kid. He grew up in New York City, the son of poor but proud parents. Barely intohis teens, he became a freelancer, writing boy's adventure tales. He eventually pounded out 30,000 words of dime-novel drama every week, even while he attended City College of New York. Sinclair aspired to be a great writer of serious books, but he admitted that all his hack work led him to use too many cliches and exaggerations. Even Sinclair's biographer, William Bloodworth, said the overwrought Sinclair style can be too much to take. "It's not what I would consider great literature," said Bloodworth, the president of Augusta State University in Georgia. "There isn't much character development in his works or subtlety. What he was good at was descriptions ... of turning real-life situations into fiction." Sinclair's first novel, "Springtime and Harvest," published in 1901, did not sell. Neither did his second, third or fourth novels. Literary society ignored him. His only child, David, nearly died of pneumonia. He grew increasingly distant from his newlywed wife, Meta, and demanded that the two practice celibacy. Frustrated, Sinclair wrote a "letter to the world" with almost hysterical self-pity: "You may sneer ... but you will live to blush for that sneer." The young writer needed something to give him hope. He found it in the revolutionary doctrine of socialism. Sinclair wrote socialist propaganda and made socialist friends, among them writer Jack London and wealthy eccentric George Herron. With the help of an allowance from Herron, Sinclair went off to work on his latest project -- a Civil War novel. "The place selected was Princeton," Sinclair wrote, "because that university possessed the second-largest Civil War collection in the country. So in May 1903, the migration took place and for three years and a half Princeton was home." Sinclair never liked Princeton. He hated the cold and the mosquitoes and the "ignorance" of his farmer neighbors. 'The families ... contained drunkards, degenerates, mental or physical defectives, semi-idiots, victims of tuberculosis or venereal disease and now and then a petty criminal," he later wrote. Still, Sinclair was full of hope as he pitched a canvas tent on a farm on Ridge View Road and wrote his novel, "Manassas." It was a modest success, enabling him to buy a 60-acre farm of his own on Province Line Road andmove into an actual house with his wife and son. Sinclair then read of a meat-packing strike in Chicago, and knew he had a good plot for the first great socialist novel. For two months in 1904, Sinclair wandered the Chicago stockyards – a place he would write of as "Packingtown." He mingled with the foreign-born "wage slaves" in their tenements and heard how they'd been mistreated and ripped off. He saw for himself the sloppy practices in the packing houses and the mind-numbing, 12-hour-a-day schedule. Then it was back to the quietwoods of Princeton to write "The Jungle." Sinclair hunkered down in a hand-built, 18-by-16-foot cabin and took pen to paper. "For three months I worked incessantly," Sinclair later said. "I wrote with tears and anguish, pouring into the pages all the pain that life had meant to me." "The Jungle" was the story of Jurgis Rudkus, a Lithuanian immigrant working in Packingtown. Jurgis sees his American dream of a decent life dissolve into nightmare as his job hauling steer carcasses in the stockyards leaves him bone-weary and unable to support his family. He loses his his job when he beats up his boss, furious at discovering the cad seduced his wife; then he loses the wife to disease and his son to drowning. But Jurgis finds rebirth upon joining the socialist movement, and the book closes with a socialist orator shouting: "Organize! Organize! Organize! ... CHICAGO WILL BE OURS!" It was stirring, melodramatic stuff, but five publishers found it too politically hot to handle and turned the novel down. Sinclair persisted and got Doubleday to publish it in February 1906. "The Jungle," in all its sordid detail, was soon acclaimed as the most revolutionary piece of fiction of the age. In London, future Prime Minister Winston Churchill said the book "pierces the thickest skull and most leathery heart." Mostly, however, the politicians ignored the anti-capitalist plot of the book and focused on eight pages describing the sickening standards of meat packing. Roosevelt sent his own agents toChicago to investigate whether meat packing was as bad as Sinclair described. The conditions were actually a hundred times worse, the agents reported back. The president invited Sinclair to the White House and solicited his advice on how to make inspections safer. By June 30, Congress had passed the Pure Food and Drug Act, cracking down on unsafe food and patent medicines, and the Meat Inspection Act. To this day, our hamburgers, chicken patties and other meats are safeguarded by the same law. Roosevelt was so taken with Sinclair that he coined the term “muckrakers” to describe him and other reformist crusaders, even though the president’s phrase was not meant to be wholly complimentary. Yet Sinclair considered his triumph empty. He complained that the tragedy of industrial life and his socialist preaching were being lost in the meat controversy. "I aimed at the public's heart, and by accident I hit it in the stomach," he said. Still, Sinclair was hardly done muckraking. He ran for Congress out of Mercer County on the socialist ticket that fall of 1906, finishing a distant third with 750 votes. He produced his own stage version of "The Jungle," which premiered at Taylor Opera House in Trenton. In the winter of 1906-07, with $30,000 in book royalties, he founded a cooperative colony at Helicon Hall on the Jersey Palisades. It drew 40 families, but the would-be Utopia burned down the following March. That was to be the pattern for therest of Sinclair's long life: success followed by failure. He divorced Meta and married twice more. He wrote dozens of forgettable novels but then won the Pulitzer Prize in 1945 for "Dragon's Teeth." After moving to California, he waged one of the more remarkable campaigns in political history in 1934, running for governor on a revolutionary Democratic platform called "End Poverty in California" or EPIC. Derided as a crank and a mystic, he still nearly won. Sinclair lived to be 90. In the last year of his life, in 1968, he came full circle - moving back to New Jersey to be near his son's family in Bound Brook. Right up to his death, Sinclair would be taken in a wheelchair to talk about his life's struggles in high schools. At Bridgewater-Raritan High School, the original muckraker got one of his last tributes from a teen-aged girl. "You're cool, Mr. Sinclair," she told him.